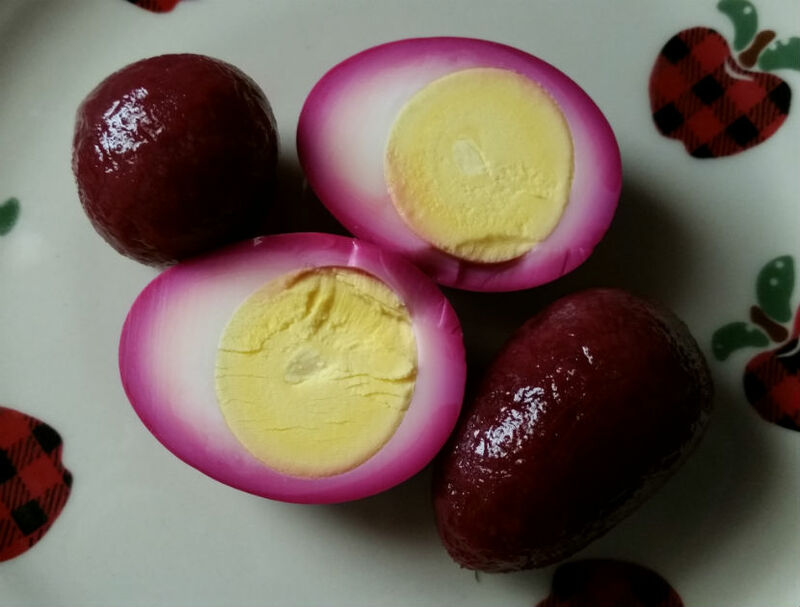 When I first tried purple pickled eggs was quite some time ago. I was hesitant at first since beets were not my favorite to eat but it was a new food adventure to try. The purple color was so inviting that I couldn’t resist so I cut one in half and took a bite. To my surprise the flavor was so good. It had a sweet and acidy flavor. The two flavors went mixed together well. From then on I really liked them. I had often thought of making them for a special holiday such as Easter but never did until now. I looked up a few recipes to see which I like the best. There are different variations of them. Some use onions or sugar. I choose sugar over the onions because I wanted that sweet taste to mine that I had tasted when I first tried them. After getting that settled. I gathered my ingredients together and made them. I was excited! They are so easy to make that I am not sure why I didn’t do this before. I took the jar out of the refrigerator and screwed the lid off. I used a spoon to scoop an egg out of the beet juice. It was very purple. I placed it on a plate. Then I cut it open. The yoke was yellow and the egg white part was a little white and purple. It looked just like other photo’s I’ve seen. I took a bite and to my delight it was really good. I could taste the mixture of the sweet and acidy beet flavor. Neither flavor over powered the other. I’d say my first time making them turned out pretty good which made me really happy! First you’ll put your eggs in a large saucepan. Cover the eggs with enough water so they are all covered. Then place your eggs on the stove burner with a medium heat until start boiling; then lower heat to a low to simmer setting. When done pour off the hot water and add cold water over the eggs to cool. You may have to do this a few times to make sure they cool down good. Separate the beet juice from the beats and put the juice into a sauce pan. Add the vinegar and sugar. Stir all together. Bring to just a boil making sure sugar is dissolved. Then remove from heat to cool. Place eggs into a large mouth 36 oz. jar. Then place the beets on top. Pour beet mixture over the top. Add a little water if eggs are not covered. Then put lid on tightly and gently shake it to mix evenly all over the eggs. 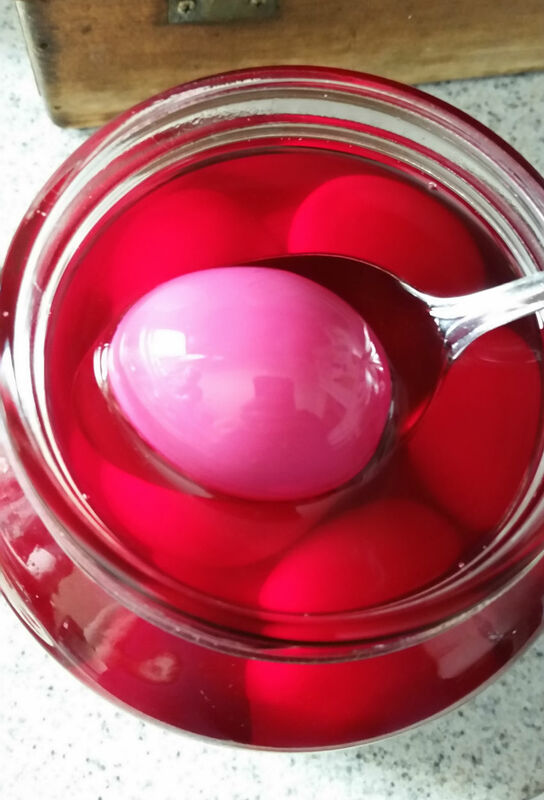 Place the jar of eggs in the refrigerator and wait for three days to enjoy. 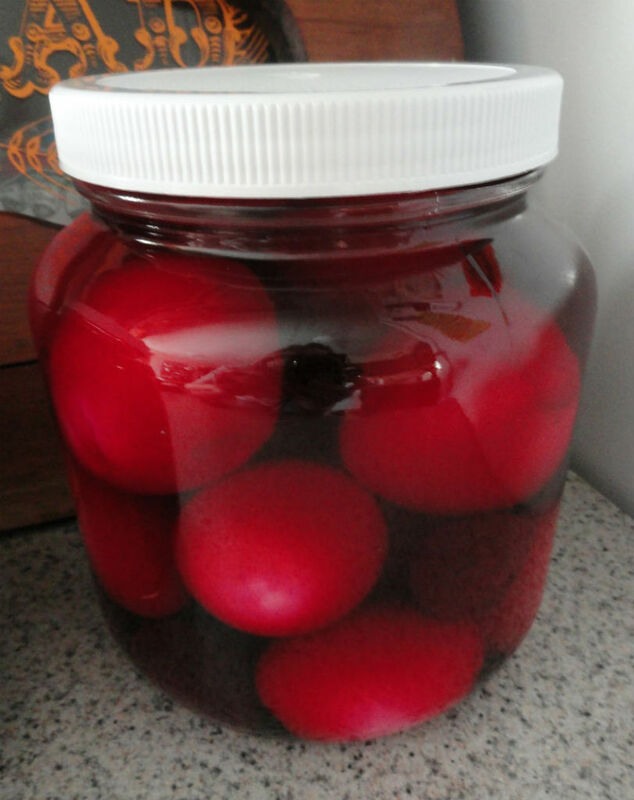 Pickled eggs will last one month in the refrigerator. I have not had the pickled beets or the pickled eggs in beet brine in forever! I love those, Grandma made them and no one else seemed to follow. Great recipe Cheryl!